Somehow my sister recruited me to make another wedding cake for a friend. This was the inspiration. She wanted it to look just like this. It looked easy enough, so I agreed. But as the date got closer and gave it some thought, I realized this cake would be a lot more difficult than anticipated. I had several anxiety attacks over this cake. It may look simple, but to keep that tall middle from tipping or leaning over was practically impossible. The whole time I just kept saying, "why am I doing this, I am not a professional baker." I was more precise with this cake than ever before. I measured everything and even used a leveler, but I still couldn't keep it from leaning. In the end it was a good learning experience. The bride loved it and it tasted amazing, so I'll count it as a success anyways. Since I have a few pictures, I thought I'd show you some things I loved from the reception. I loved the old warehouse building. Loved that she used a dresser for the sign in table. The birdcage was so cute too. Loved the pom-pom wall, it was stunning. My sister also talked my mom into doing the flowers. I loved the use of the yellow billy ball flower (aka craspedia). I especially liked them used with the boutonnieres. Pretty but still very manly. My daughter's first reaction when she saw your cake? "Oooh, pretty cake!" Okay, she's only four but very opinionated. So you did good. Cakes are harder than they look. Good job! BTW, where was this warehouse location? You must live close to me. you did a beautiful job! my sister is getting married in august, and i am in charge of setting up the reception! so looking forward to it---peach, mint, light yellow, gray, and white are her colors. Your cake was stunning!!! What great ideas for props at her wedding! Hi! I think turned out great! It looks yummy! I just wanted to stick my finger in that frosting! I think it would be super hard! I love your blog and have been a follower for a while I would love it if you would stop by, take a look around and if you like what you see...become my newest follower! your cake is perfect, it looks JUST like the inspiration! great job! I thinks that's the same wedding dress as I wore - but 4 years ago! Oh how funny - and kind of exciting! :D Everything looks gorgeous! I think the cake looks amazing and the flowers are beautiful too. You have such a talented family! I am trying to make your cupcake cake for my daughters first birthday party. The cake turned out great! But I'm having a really hard time with my fondant and my icing! Drooping!! Good job on the cake! The wedding looks like it must have been beautiful! Oh I so know what you mean about being a nervous wreck when making wedding cakes! I can't sleep the night before the wedding even! Just a tip which you probably know- buy some small dowels and cut 3-5 pieces the depth of the layers. Then if you want you can use one long dowel the depth of all three layers - starting in dead center of top cake push it through the remaining layers. Everything, especially the cake is stunning! Where is that building? Um you totally have to call yourself a professional baker. That cake is AMAZING. I bet the original had cardboard between the layers to keep it straight. cardboard between the layers and lots of McDonald's straws might help. It looks beautiful and I bet it tasted yummy! gorgeous wedding!!! Amazing job on the replica of the cake!!!!!!! I absolutely hear you on the anxiety attacks!! 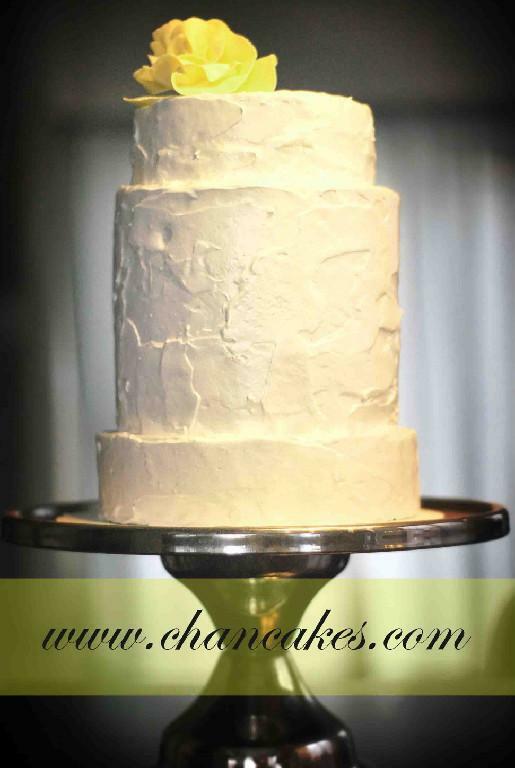 I've actually said I will never do another wedding cake b/c it's just too much pressure! But then I keep agreeing to more! Yours looks fabulous! And sometimes those designs that look easy are the harder ones to do! The reception is stunning! I SO wish I could do my wedding over again after seeing some of these awesome pictures! I was watching an amazing cakes episode and the baker literally put a pole in the middle so he could balance the cake layers, then set the cakes on top of one another pushing the pole through each layer. Your cake looks stunning!!! Great job! And I really like the boutonnieres...very manly! You are not a baker... you just play one on the internet? Seriously, I think it is lovely. And it looks like it might taste good too which is the point of a cake, right? Dang girl you bake too? It looks just like the inspiration photo to me. Great job, I'd eat it. Hey! You did a great job there! You rock! I think a little bit of slant gave it more character than the one that you copied and it looks great!